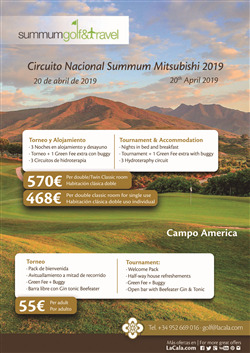 Next Saturday, April 20, La Cala Resort will host one of the most prestigious tournaments on the national amateur scene, the Summum Mitsubishi 2019 National Circuit, which will be held in the spectacular America course of the golf and leisure complex. La Cala Resort becomes the host of this important sporting event whose game modalities are 'stableford' individual 18 holes. The Organization has spared no expense to make the event a great success. They will offer a large number of facilities to make the journey of this day even more attractive. Players will enjoy a Wilson DX2 balls welcome pack, Half-way house refreshements with Iberian and gourmet products, shared buggy, and some unusual services such as open bar with Gin & Tonics “Beefeater”. On this occasion, the resort has launched an interesting proposal that combines golf and hotel. This includes three nights in bed and breakfast basis in classic rooms with terrace the package of the tournament green fee (consisting of the Green Fees to participate in it and another extra Green Fee of 18 holes), three hydrotherapy circuits of 90 minutes per person at a price of 285 euros per person in a double room. Also, non-golfers can exchange two Green Fees for 1 aromatherapy massage or a sports massage in the exclusive La Cala Spa. The competition is limited to players (male & female), of any age, with Spanish or other International handicap. No limit of handicap but to qualify for a prize in category 1, the maximum handicapis up to 15,4 and from 15.5 for the second category. The inscription in the Summum Golf is 55 euros. Children under 17 can also participate in the junior category and at the price of 42 euros. La Cala Resort on the Costa del Sol is one of the most renowned golf resorts in Andalusia. It has three, 18-hole golf courses designed by Cabell Robinson and an academy located next to the six-hole par-three golf course. It is also home to a FIFA regulation football field and sports facilities and is the only one of its kind with an eight kilometre running path. The hotel has 107 rooms, three themed restaurants and a spa that is over 1,300 m2—not to mention the many other services and amenities that the resort has to offer. La Cala Resort was awarded Best Luxury Mountain Hotel at the SPAIN LUXURY HOTEL AWARDS 2018, which recognises the efforts made by hotels to be considered among the best in their field. Evaluation is based on excellence in client services and resort design, environment and management.